Here is story about a printer that I’ve recently become acquainted with. The company is Metropolitan Printing Service from Bloomington, Indiana. Since my first interaction with them, I’ve been absolutely blown away by how they promote themselves and interact with customers & prospects. I first met them thanks to Twitter. Christine Flynn is an employee of Metropolitan Printing Service and the incredible person behind the @Tini_Bop twitter account. Through her Twitter page, Christine does a remarkable job in sharing interesting & helpful content. But more importantly, she uses her account to engage with people. Thanks to her efforts, I was introduced to their printing company and became determined to learn more about them. 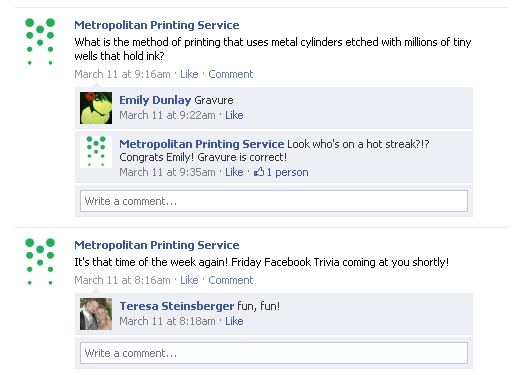 One of my favorite things that they do in regards to social media is their “Friday Facebook Trivia” contest. Each Friday, they hold a contest on their company’s Facebook page. I think this is one excellent way for a printer to use Facebook as a way to increase awareness about their brand, to engage with their customers and prospects, and to start demonstrating the human side of their business. Q. How did you come up with the idea for Friday Facebook Trivia? A. A sister company of our’s (@GarnerPrinting) has been hosting a similar contest every Friday. They even throw in a “mystery” machine on the last Friday of every month where you have to guess what the machine is that they are using in the photo. It’s an awesome tool to educate the client even more about our services. With that being said, I was just having a terrible time getting fans on Facebook. I had no trouble growing our Twitter account, but our Facebook page was almost entirely made up of employees of Metropolitan Printing Service or Consolidated Graphics our parent company. Q. Did you have to sell the idea to the boss? Or are you empowered to launch programs like that on your own? A. I launched all of our social media sites without really getting “permission” from my boss – but the FFT I ran past him the day before I decided to post the first question. There wasn’t so much a selling of the idea as it was a heads-up of how I felt we could generate more traffic. Q. How have people responded to it? A. It has absolutely helped accomplish our goal. The number of Facebook fans has greatly increased since we launched the contest. Now my goal is to get more targeted fans – i.e. more Bloomington/Indy based companies. I am doing this by associating with their pages (thankfully, FB lets me interact as Metropolitan Printing Service on other pages now). I am also hoping to get it to take off by having our sales reps spread the word about the FFT and other contests we may offer. For example, they may possibly offer an incentive with a % off a print job or a gift card to one of our local eateries for the 100th, 150th etc person to join our Facebook page. Q. Do you feel that social media has helped your company? A. Yes. While I do not claim to be a social media guru — in fact I am digging every day to try to figure out more effective ways to utilize the medias — I do feel as though we are effectively communicating a message to our consumers. My goal is to keep them as informed about the happenings at Metropolitan Printing Service as I can. I want to share information about new technologies and innovative solutions. Being able to voice that to the customer in my words really enables me to make sure they know exactly what we have to offer. I think both you and @tini_bop Rock! So there you have it in one concise statement. You are too sweet Cheri! Jason is freaking awesome!!! 🙂 Thanks again!